ABSTRACT: History has shown that voters tend to support candidates of their own race. This reality has proven particularly challenging for black candidates who have often had difficulty running for office in majority white electorates. However, the vast majority of research on this topic has focused on minority Democrats, not minority Republicans. In this study, we take advantage of a unique set of circumstances in South Carolina’s (SC’s) 2014 elections where voters had the opportunity to cast ballots for an Indian-American Republican Governor and an African-American Republican Senator. Additionally, the presence of a white Republican Senator seeking reelection provides an important comparison case for determining if there is significant variation in support of these candidates given their different racial profiles, but shared party affiliation. Using unique data from The Winthrop Poll, we find that the determinants of approving of, and voting for, minority Republican candidates, are quite similar to support for the white Republican candidate. 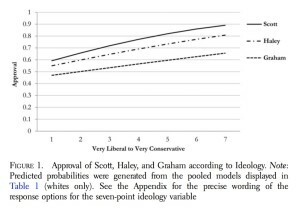 It appears that party and ideology are foremost in guiding approval and vote choice decisions among voters in contemporary American politics. Hence, even in SC, support for minority Republicans approximates that given to a white Republican. 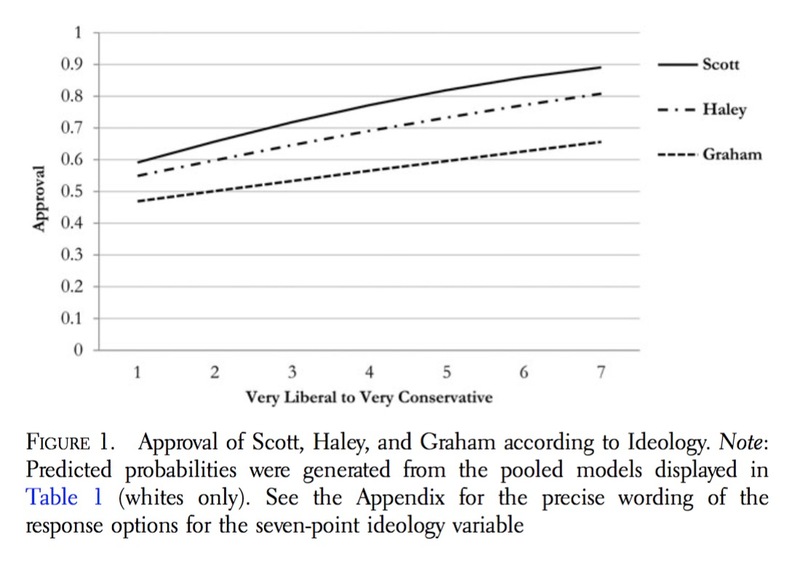 One of the findings from the article very interestingly show that among the core of Republican voters (self-identifiers, tea party sympathizers, and conservatives), Tim Scott and Nikki Haley receive more approval and electoral support among white voters compared to Lindsey Graham. CITATION: Huffmon, Scott H., H. Gibbs Knotts, and Seth C. McKee. 2016. “Similarities and Differences in Support of Minority and White Republican Candidates.” Journal of Race, Ethnicity, and Politics 1 (01): 91–116.